This page shows traps that can be used for catching snakes. These can be used for catching many different species of snakes in both water (shoreline) and land. Most can have their entrance holes adjusted to allow thick or fat snakes entry. 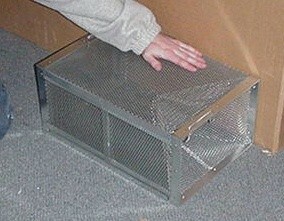 However, it is important that you have a trap large enough to hold all the snakes that might enter the trap. 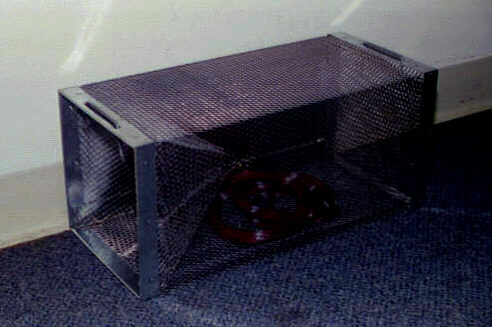 SNAKE TRAP SIZE: This trap uses a funnel design entrance through which snakes can enter but not exit. 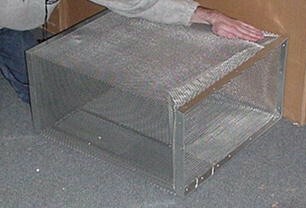 It is 8"T x 8"W x 16"L. You can bait it with a frog, mouse or minnows, but generally you will be able to catch snakes by having it placed right. Good places to set the trap depend on the snake you are trying to catch. This may be along a fence row, a rock wall, the shore of a pond or stream, against a structure like a house or shed. Use this design for snakes which are smaller than 3 feet. It has a sliding door for easy snake removal. The funnel may be cut open if you have a snake which is unusually thick. This is a single door trap. 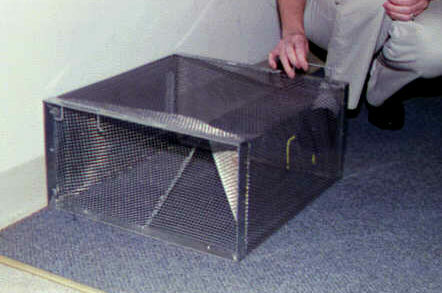 SNAKE TRAP SIZE: This trap uses the same funnel design as the small model listed above. However, this is a true "double door" version or model. It' slightly smaller, at just 6"T by 6"W x 18"L, but because it has two doors instead of just one, it may prove more productive for catching unwanted snakes. You can bait it with a frog, mouse or minnows, but generally you will be able to catch snakes by having it placed right. Good places to set the trap depend on the snake you are trying to catch. This may be along a fence row, a rock wall, the shore of a pond or stream, against a structure like a house or shed. Use this design for snakes which are smaller than 3 feet. It has a sliding door for easy snake removal. The funnels may be cut open if you have a snake which is unusually thick. SNAKE TRAP FEATURES: This trap works like the small trap. It has a funnel designed to let snakes enter but not escape. It is better suited for large snakes which may be 3 - 4 feet long. The entrance funnel (this is a one door trap) may be cut with wire cutters to allow extra large or thick snakes like water mocassins or rattle snakes to enter. There is a sliding door for easy snake removal. Bait with either a mouse, frog, fish or other food stuff the local snakes are feeding on. SNAKE TRAP FEATURES: This trap works like the small trap. It has a funnel designed to let snakes enter but not escape. It is better suited for large snakes which may be 4 - 5 feet long. The entrance funnel (this is a one door trap) may be cut with wire cutters to allow extra large or thick snakes like water mocassins or rattle snakes to enter. There is a sliding door for easy snake removal. Bait with either a mouse, frog, fish or other food stuff the local snakes are feeding on. SNAKE TRAP FEATURES: This trap works like the small trap. It has a funnel designed to let snakes enter but not escape. It is better suited for large snakes which may be over 5 feet long. The entrance funnel (this is a one door trap) may be cut with wire cutters to allow extra large or thick snakes like water mocassins or rattle snakes to enter. There is a sliding door for easy snake removal. Bait with either a mouse, frog, fish or other food stuff the local snakes are feeding on.